W I N N I P E G F R E E P R E S S S P E C I A L F E AT U R E | S AT U R D AY, O C T O B E R 2 5 , 2 0 1 4 WE DAY RETURNS TO CELEBRATE CHANGE-MAKERS From left to right: Neepawa Area Collegiate students Cecily Taylor, Eva Kwok and Robyn Birch prepare lunch at Siloam Mission kitchen. I f your whole life were stuffed into a backpack, what would it look like? A collection of personal mementos mixed with the odd necessity — a toothbrush, umbrella, warm hat? A few shirts, snacks and Band-Aids? These were the questions students at Neepawa Area Collegiate grappled with as they went shopping to provide backpacks equipped with essential products for homeless men. The effort was part of the We Act program, where students commit to one local and one global cause. During the process, they struggled to stay within their budget as they debated the size, quality and number of items to include. "It made me think of how much stuff I have — I don't think I could pack my life into one backpack," says Samantha Nickart, a Grade 10 student. "This whole experience made me feel lucky for what I have." As part of a youth justice group called Helping Others Pursue Equality (HOPE), the students did a clothing drive in support of Siloam Mission in Winnipeg to fill the backpacks. "We did a food drive for Winnipeg Harvest last year we called 'The Hunger Games,' given how popular the film was with students, and decided to call the clothing drive 'Catching Fire,' " explains Michelle Young, teacher advisor of HOPE. In competition style, the grades were identified by districts, just like in the film, with each clothing or hygiene item given a point value. The winning district won a class barbecue. Taking their work one step further, the students travelled two hours to volunteer their time at Siloam Mission. They prepared and served meals, sorted donations and wrote thank- you cards to supporters. "My experience was exciting, inspiring and memorable," says Grade 11 student Bethany Bertholet. "I prepared bagged WE DAY, WE ACT EmPOWER A GENERATION OF YOUTh LEADERS Students engage with local issues, find passion for helping the homeless By Kimberly Lochhead Youth can't buy a ticket to We Day. They earn their way in by taking action on one local and one global issue. By Paria Pishva T his year, the We Day Dance is going global with an epic new video, inspired by a fresh We Day track from Kardinal Offishall — "We Turn it Up." "It's about getting people energized," says Kardinal, a long- time Free The Children ambassador, not to mention an award- winning rap artist and music producer. The Canadian-born artist is also widely recognized for his work with his own charity, 30 Elephants, which provides youth with cultural experiences to inspire positive change. 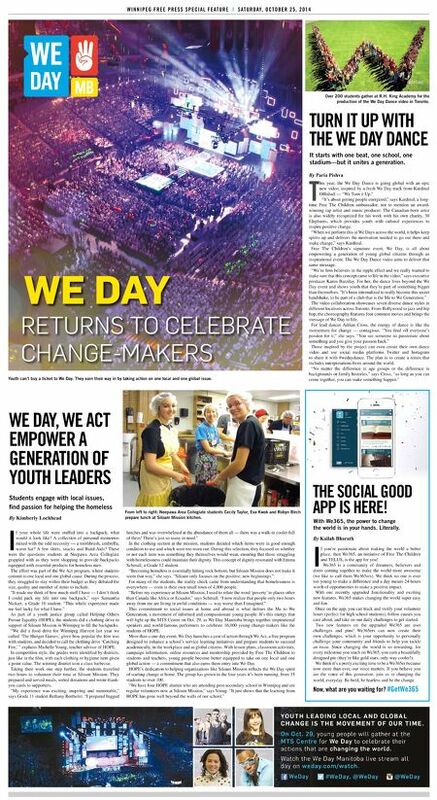 "When we perform this at We Days across the world, it helps keep spirits up and delivers the motivation needed to go out there and make change," says Kardinal. Free The Children's signature event, We Day, is all about empowering a generation of young global citizens through an inspirational event. The We Day Dance video aims to deliver that same message. "We're firm believers in the ripple effect and we really wanted to make sure that this concept came to life in the video," says executive producer Karen Barzilay. For her, the dance lives beyond the We Day event and shows youth that they're part of something bigger than themselves. "It's been internalized to really become this secret handshake, to be part of a club that is the Me to We Generation." The video collaboration showcases seven diverse dance styles in different locations across Toronto. From Bollywood to jazz and hip hop, the choreography features four common moves and brings the message of We Day to life. For lead dancer Adrian Cross, the energy of dance is like the momentum for change — contagious. "You feed off everyone's passion for it," she says. "You see someone so passionate about something and you give your passion back." Those inspired by the project can even create their own dance video and use social media platforms Twitter and Instagram to share it with #wedaydance. The plan is to create a remix that includes interpretations from around the world. "No matter the difference in age groups or the difference in backgrounds or family histories," says Cross, "as long as you can come together, you can make something happen." TURN IT UP WITh ThE WE DAY DANCE It starts with one beat, one school, one stadium—but it unites a generation. Over 200 students gather at R.H. King Academy for the production of the We Day Dance video in Toronto. By Kailah Bharath I f you're passionate about making the world a better place, then We365, an initiative of Free The Children and TELUS, is the app for you! We365 is a community of dreamers, believers and doers coming together to make the world more awesome (we like to call them We365ers). We think no one is ever too young to make a difference and a day means 24-hours worth of opportunities to make a positive impact. With our recently upgraded functionality and exciting new features, We365 makes changing the world super easy and fun. Once on the app, you can track and verify your volunteer hours (perfect for high school students), follow causes you care about, and take on our daily challenges to get started. Two new features on the upgraded We365 are user challenges and pins! We365ers can now create their own challenges, which is your opportunity to personally challenge your community and friends to help you tackle an issue. Since changing the world is so rewarding, for every milestone you reach on We365, you earn a beautifully designed pin (they're like gold stars, only way cooler!). We think it's a pretty exciting time to be a We365er because now more than ever, our voice matters. If you believe you are the voice of this generation, join us in changing the world, everyday. Be bold, be fearless and be the change. Now, what are you waiting for? #GetWe365 ThE SOCIAL GOOD APP IS hERE! With We365, the power to change the world is in your hands. Literally. lunches and was overwhelmed at the abundance of them all — there was a walk-in cooler full of them! There's just so many in need." In the clothing section at the mission, students decided which items were in good enough condition to use and which were too worn out. During this selection, they focused on whether or not each item was something they themselves would wear, ensuring that those struggling with homelessness could maintain their dignity. This concept of dignity resonated with Emma Schmall, a Grade 12 student. "Becoming homeless is essentially hitting rock bottom, but Siloam Mission does not make it seem that way," she says. "Siloam only focuses on the positive; new beginnings." For many of the students, the reality check came from understanding that homelessness is everywhere — even in their own small town of 4,000 people. "Before my experience at Siloam Mission, I used to relate the word 'poverty' to places other than Canada like Africa or Ecuador," says Schmall. "I now realize that people only two hours away from me are living in awful conditions — way worse than I imagined." This commitment to social issues at home and abroad is what defines the Me to We Generation, a movement of informed and compassionate young people. It's this energy that will light up the MTS Centre on Oct. 29, as We Day Manitoba brings together inspirational speakers and world-famous performers to celebrate 16,000 young change-makers like the students of HOPE. More than a one-day event, We Day launches a year of action through We Act, a free program designed to enhance a school's service learning initiatives and prepare students to succeed academically, in the workplace and as global citizens. With lesson plans, classroom activities, campaign information, online resources and mentorship provided by Free The Children to students and teachers, young people become better equipped to take on one local and one global action — a commitment that also earns them entry into We Day. HOPE's dedication to helping organizations like Siloam Mission reflects the We Day spirit of starting change at home. The group has grown in the four years it's been running, from 35 students to over 100. "We have four HOPE alumni who are attending post-secondary school in Winnipeg and are regular volunteers now at Siloam Mission," says Young. "It just shows that the learning from HOPE has gone well beyond the walls of our school."